What are clock keys? I’m sure you’ve seen the type shown in the featured image above. Above is a size 1 key, meaning that it is meant for a 2.50 mm sided shaft. 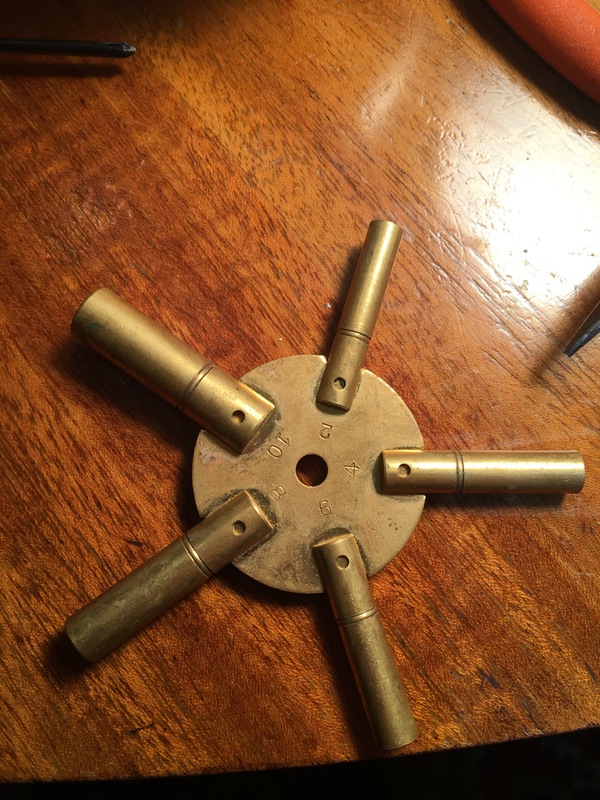 If you are like me and work with lots of clocks, you may have one of the multi-sided keys shown below. Typically key sizes are #’s 2-10, but they can go smaller. The key turns and winds the spring, storing up the energy. The Ansonia Miniature Wall Clock is shown above. The spring has a visible central shaft with what looks like an inner gear on top of it. 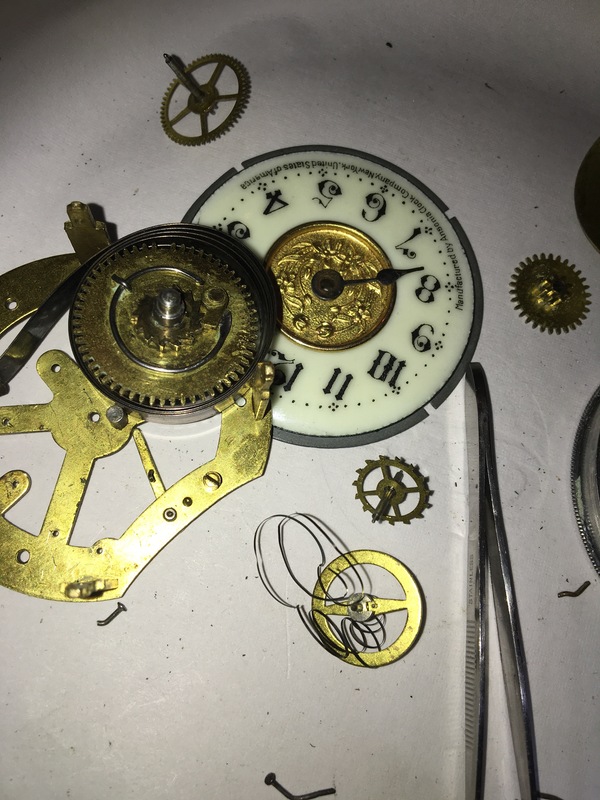 As you rotate the key clockwise the gear will rotate one tooth at a time, with each tooth locking into place to prevent the spring from unwinding. Occasionally you get the problem I faced with the 1930s Lux Bluebird Pendulette Clock. 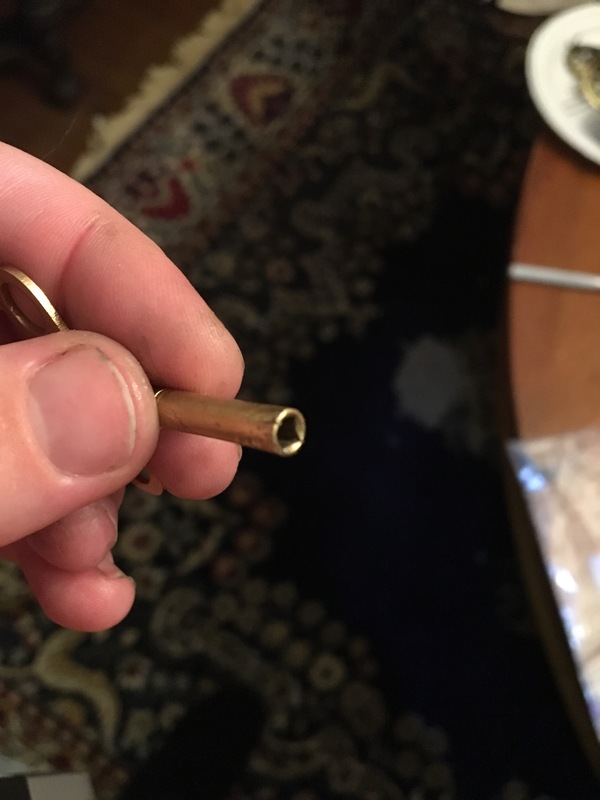 The picture below is a close-up of the turning shaft of the spring, what is supposed to presumably fit a regular size 2 key. If you notice, the sharp corners of the shaft have been rubbed down over repeated use. Image that Bob owns this clock and it stops. He tries winding it and it still won’t go. He tells Mary, who also tries winding it. Bob’s daughter Amy later sees that it’s not running and tries winding it. As it gets more and more tightly wound it will become harder and harder to turn, but to someone who doesn’t wind it regularly they may not notice. In addition, those sharp corners of the shaft are getting ground down. That’s how we get what’s shown above on the Lux clock – the square shaft is being stripped, the same way a screw does. The #2 key is now too large to fit the Lux shaft, so I purchased the #1 key and filed down the sides of the winding shaft to approximate a square. Unfortunately I fell victim to the same problem as Imaginary Bob & friends: I over wound the clock and the thin #1 key couldn’t stand the stress. If you look closely at the picture below, you can see cracks starting to form at the tip of the key. I suppose that if this continues then I will file the square shaft down further until it fits a 2.25mm #0 key. Keys come as small as 1.75mm for a #000. Let’s all hope it doesn’t come to that. To all the future clock makers of the world: please use a hard metal on spring shaft so they don’t grind down over time! Filing the shaft down to square is difficult and imprecise. 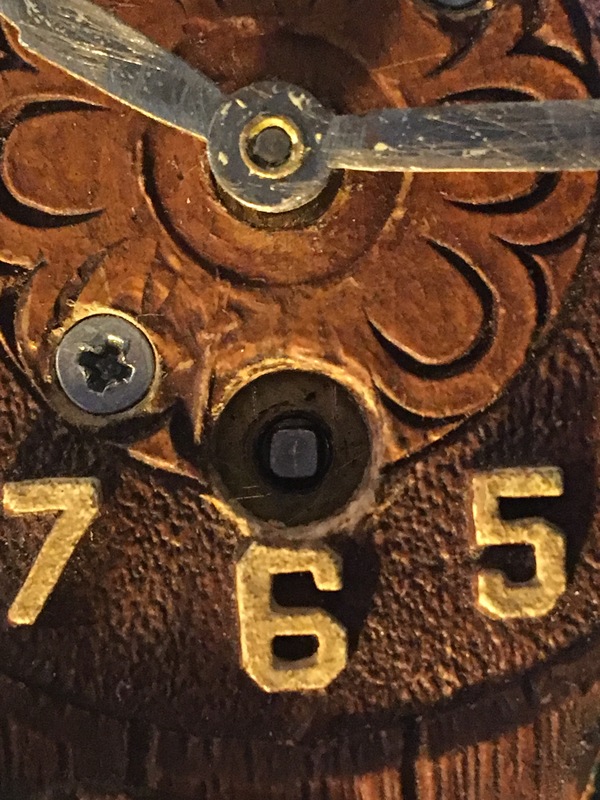 And to all clock owners who use a key: know how many winds you need to do to fully wind your clock, and when you feel that the pressure against turning the key is too great, stop. If it’s working then it’s fully wound, and if it’s not working then winding it further will only make problems worse. Next Next post: Swindled! Hoaxed! Bamboozled!